TelVue Field Application Engineer Brian Albertson has been tapped to participate in an upcoming seminar on “Navigating the IP Broadcast Revolution”, a free lunch presentation sponsored by High Output in Boston later this month. 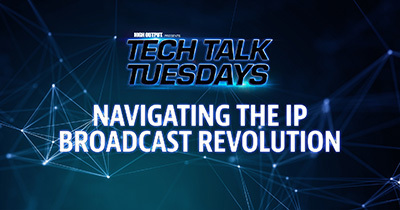 The “Tech Talk Tuesday” event will “demonstrate real-time examples of live broadcast IP workflows, from acquisition to content distribution”, and include demonstrations of a range of IP broadcast solutions for local public, educational and government TV operations. Albertson will be demonstrating the versatility of the IP workflow, such as tuning in to a neighboring town’s live event, football game, meeting, and leveraging internet feeds; going live from anywhere with portable encoders and an ever-growing array of mobile options; simplify connectivity with backhaul over the LAN. For an example of the kind of go-live-from-anywhere scenario that will be covered, check out these instructions in the TelVue Knowledgebase for pairing up a JVC camera to a HyperCaster for live coverage using RTMP. TelVue and High Output are partnering in this event with Broadcast Pix and JVC for a broad overview of how new technology now allows us to broadcast live, ultra-low latency content over a network without compromising signal quality. If you’re in the Boston area on August 29th, sign up for this free tech learning opportunity here.